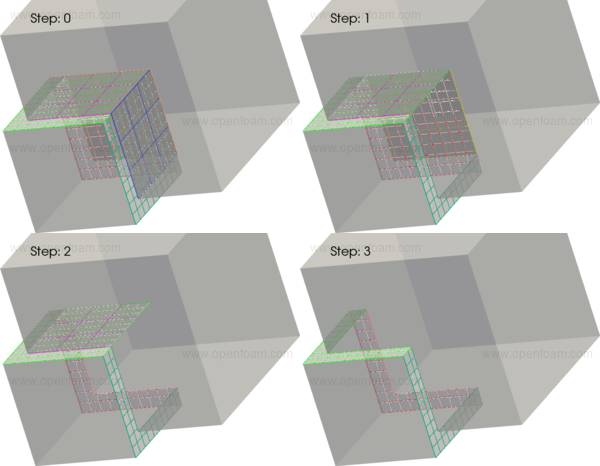 The cfmesh project is available as a component of OpenFOAM v1712, complementing the existing blockMesh and snappyHexMesh meshing utilities. file: tutorials/incompressible/simpleFoam/pitzDaily/system/fvSolution at line 28.
in file db/dictionary/entry/entryIO.C at line 262. The stitchMesh utility stitches two volumetric meshes by manipulating the interfacing faces to create topologically conformal interface. Previously the utility was operated only via command line options, now it could be operated via a stitchMeshDict dictionary file. Use of the utility is limited on situation with simple patches, as the only information processed are the faces, no edges or line elements are taken into the account. Further user should make sure the stitched patches have no or very little (case sensitive) gap otherwise the algorithm will either result in sliver edges or too large deformation of the mesh.